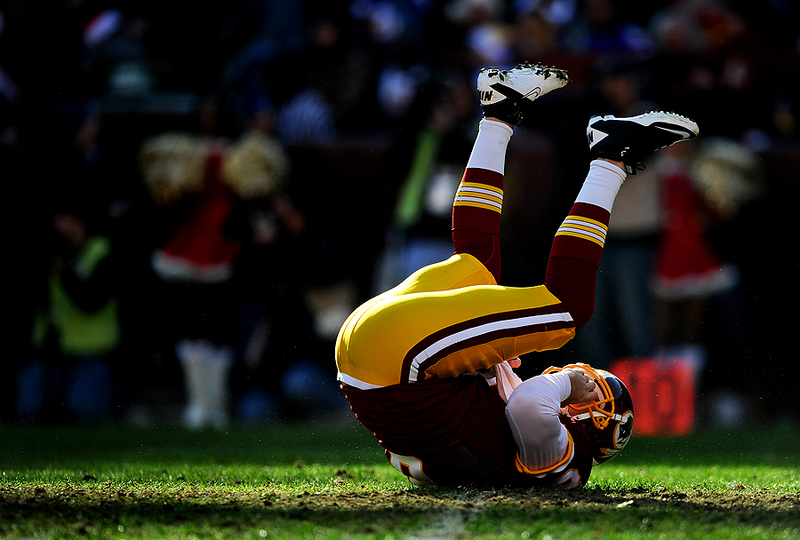 "Quarterback Rex Grossman #8 of the Washington Redskins rolls onto his back after taking a hit against the Minnesota Vikings in the first quarter at FedEx Field on December 24, 2011 in Landover, Maryland. The Minnesota Vikings won, 33-26." I was going through my final images of the year and thought I'd make one last post before the new year. Despite early start times, NFL games in the winter tend to have some great light that only lasts for about a quarter or two. For this game, my teammate photographer for the day wanted to shoot from above the first two quarters. I had no problem with that, so I decided to work the back-lit side and avoid the other ugly background side of the field. Working the light of these type of games is a gamble. You can try and be safe or take risks and expose for highlights. While this isn't really either of the aforementioned, it was sort of a little magical moment that ended up telling the story of the game in the end. Thanks for reading this year. Hope you're looking forward to 2012 as much as I am. 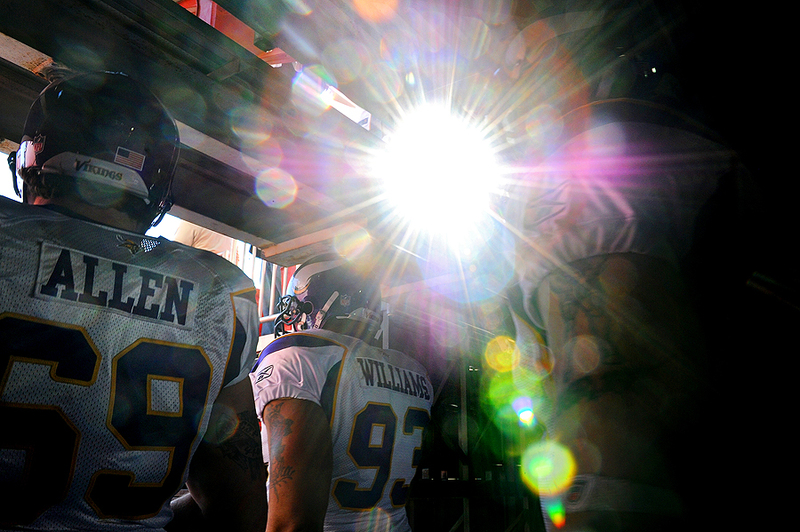 "Defensive tackle Kevin Williams #93 of the Minnesota Vikings, Jared Allen #69 and teammates enter the stadium before playing the Washington Redskins at FedEx Field on December 24, 2011 in Landover, Maryland." Serendipity is the craziest thing sometimes. While feature hunting during pregame of the Minnesota Vikings taking on the Washington Redskins NFL game at FedEx Field I stumbled into another light, lens flare image this week. Funny thing was that I saw it when I walked into the tunnel, but wasn't going to work it because of my recent Tebow, Brady flash photo. But there was a couple other photographers working the same scene so I decided to go for it. Shooting pregame features is always a big challenge to be different. I guess that's why I like doing it. Nonetheless, this frame isn't perfect in my eyes, but it worked for the game. "Place kicker Matt Prater #5 of the Denver Broncos and teammates stand in the tunnel before taking on the New England Patriots at Sports Authority Field at Mile High on December 18, 2011 in Denver, Colorado. The New England Patriots won, 41-23." Last Sunday I photographed the New England Patriots taking on the Denver Broncos. We had an amazing team of Getty photographers to work the game. Since there were four of us, we each had a quadrant of the field to work from. It was the first time I've ever been limited to a certain corner of the field. While I had literally no action in my corner of the field during the first half, I remembered to be team player and worked the action down-field from my spot. Always up for a challenge, it made me see the game differently. The game wasn't as hyped up as it was when I was assigned the game. But by the time game day arrived, it was the biggest game of the season. 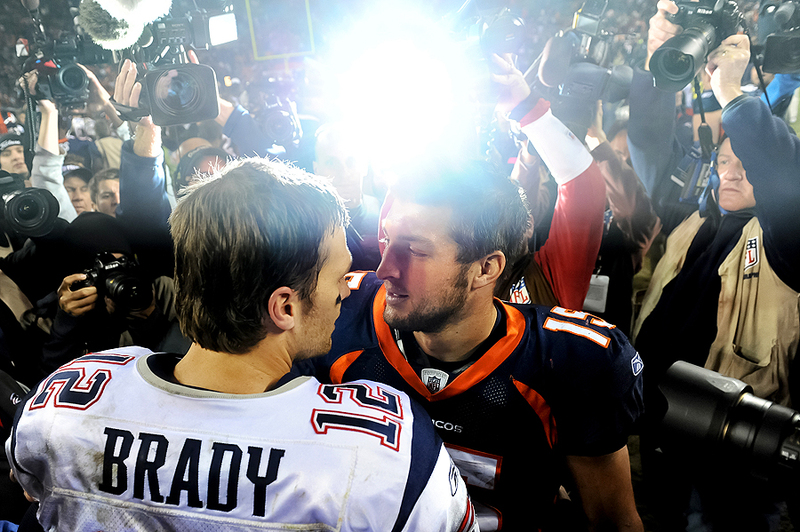 The game pitted two high-profile players against one another: Brady versus Tebow. In the process, the Patriots won their sixth consecutive game and clinched a playoff berth in the AFC East. Tebow’s six-game winning streak was snapped in the loss. As usual, I liked most of my images away from the action. I also found myself moving and focusing more on the quarterback rivalry that seemed to be one one the main story lines coming out of Denver. Hopefully I'll see one of these teams again in Baltimore for the playoffs. "Quarterback Tim Tebow #15 of the Denver Broncos and quarterback Tom Brady #12 of the New England Patriots shake hands after an NFL game at Sports Authority Field at Mile High on December 18, 2011 in Denver, Colorado." Got the opportunity to photograph the New England Patriots taking on the Denver Broncos in Denver this past weekend. Just got back east and running around before one more game of the year on Saturday, but I wanted to get a relevant image up. I had a blast out west despite sucking wind. Always great light, had surprisingly warm temperatures for the game and was fun meeting, shooting alongside some new photographers. However, I obviously forgot what it was like to shoot at 5,000 feet. I think I am still gasping for air. As for this image, I still have no idea where the light came from. I should ask Tebow. More images from the game later this week. "Referee Pete Morelli #135 and other officials take the field before the start of the Washington Redskins taking on the Arizona Cardinals at FedEx Field on September 18, 2011 in Landover, Maryland." Last year, I said it was hard to spit out the the words "Best of the Year" because I was sidelined from injury for about three months. Well, this year wasn't much better. I spent more than half of the year recovering from a serious surgery. It wasn't until May when I found the energy and inspiration to attack my first assignment post-op. And it wasn't easy. The Preakness Stakes was the last assignment I thought I'd get back into the game with as I lugged around a heavy 600mm chasing horses for 12 hours - but I survived. From that point on, I spent the latter of the year photographing what I didn't think I would be able to handle after surgery: Sports. Thanks to the amazingly talented group of editors at Getty Images, as well as some local and distant shooters, for giving me the boost and confidence I needed to overcome the pain I endured from: being unexpectedly laid-off in 2010, moving halfway across the country, and the physically, mentally challenging time spent in bed fully-recovering for months. This year, I realized I that I'll never take my health for granted. Young, driven and talented means nothing when you cannot pick up a camera and do what you love. I also learned to work light - in two ways. First, while I've always been a chaser of color and nice light, my goal for the short year was to exploit every opportunity I had to work the aforementioned. Last year, I found myself converting everything in post, not so much this year. And second, I learned to ditch the extra gear and work with the bare minimum. With those in mind, my favorite sports picture of the year didn't even happen on the field. If you know me, I love to shoot features. I enjoy the challenge of working access and making pictures others don't see - whether another photographer or a reader. This picture was made before a Washington Redskins game. I camped under the stands and waited. And waited. Then waited some more. While I was hoping for players, this image connected all the elements I look for: color, light, moment, composition, and being close. I'm super eager and looking forward to a full-year of health, happiness and shooting in 2012 - sports related or not. 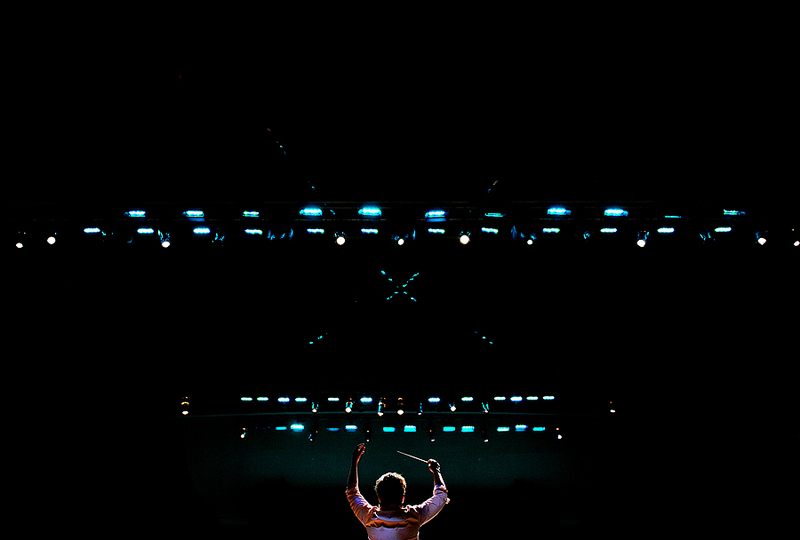 "BSO Music Director Marin Alsop conducts during Arthur Honegger's epic oratorio Jeanne d'Arc au Bücher ("Joan of Arc at the Stake") on Nov. 16, 2011 during the Baltimore Symphony Orchestra at the Joseph Meyerhoff Symphony Hall in Baltimore, Md. The production also starred Caroline Dhavernas and Ronald Guttman." One of the greatest things about being a photojournalist is getting to photograph new people, places and events. So when I got the call to cover a performance for two nights at the Baltimore Symphony Orchestra I was thrilled. While my excitement glowed, I was nervous because not once in my life had I ever been to an opera. I could only picture that I'd be fighting to stay awake like every other male that I've ever seen on television or movie attending such an event. Conversely, I was doing anything but that. BSO Music Director Marin Alsop is very much a familiar name here in Baltimore. My interaction with her, while brief, was real; as it was with all of the performers alike. The performance was simply brilliant. When sneaking around very quietly, I found myself smiling ear-to-ear. I don't know if it was the seductively sounding French coming from Caroline Dhavernas mouth, the intense music, the deep bellowing from the singers, or watching Alsop at the stand. Nonetheless, it all was fresh. Thanks again to the BSO for allowing me to do my thing and making the pair of nights a breeze. Looking forward to the next show.